As you know, we’re celebrating our 40th year of business all year long in 2017. But did you know that for over half that time, we’ve been working to perfect the art of fast and easy decorated headwear? In the year 1990, Outdoor Cap opened a full production factory in Miami, Oklahoma. By 1997, we transformed it to strictly house our domestic embroidery operations. In 2000, we moved all embroidery functions to our headquarters located in Bentonville, Arkansas. Last year was full of big changes for the domestic embroidery team. In 2016, we decorated 28% more caps than in 2015. This was achieved in part because we expanded our warehouse hours to include 4 shifts, so our machines are fired up almost 24/7. As business grew, so did the need to onboard new team members and purchase new production equipment. We have hired 21 additional full-time employees to the domestic embroidery team. Toward the end of the year, we started experimenting with a triangle approach where 1 machine operator is charged with running 3 (8-head) machines arranged in a triangle. Previously all of our machines were set in rows and each operator was in charge of only 1 or 2 machines at a time. Our custom 7-Day Domestic Embroidery program has a 48-piece minimum and includes up to 12,000 stitches. We offer FREE digitizing services and require no set-up fees. Over the next few months, I’ll be sitting down with representatives from Outdoor Cap to learn more about their role. Those interviews will be published on the blog so you can get a better sense of the entire process from the time you place your custom order to the time you receive your hats. 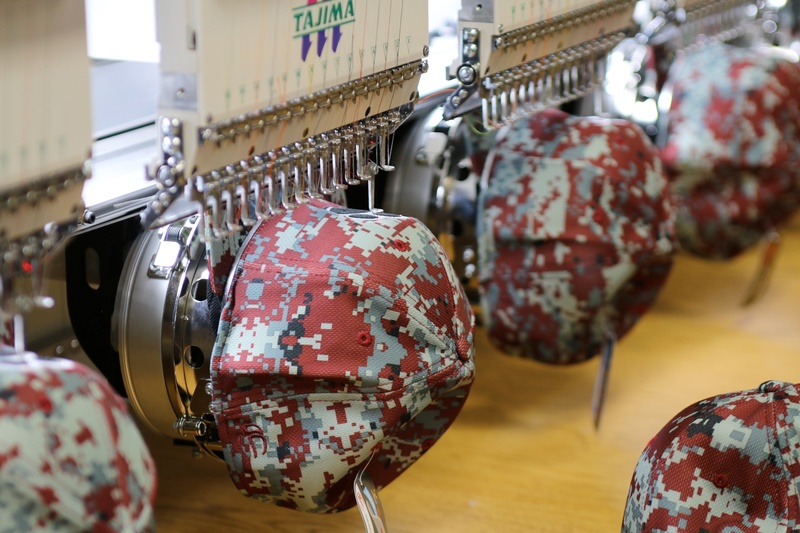 In the upcoming embroidery series, you’ll get an in-depth look at our Custom Sales and Customer Care teams, our digitizing services, quality assurance, and more. Keep checking back as we take a deep dive into each step of our domestic embroidery program. Until then, feel free to familiarize yourself with some basic embroidery terms you’ll be seeing a lot of in this series. Embroidery is a decoration technique, which uses a needle and thread to create words or images on products. Each machine has multiple needles, and each needle has its own thread color. An embroidery hoop is a tool that holds the fabric in place while the hat is sewed. Our domestic embroidery team can only accommodate two stitching techniques: Flat stitch and 3D (also known as puff, raised, or foam). Domestic embroidery is most common for ball caps, but we can also embroider knits and specialty shapes. Digitizing refers to the process of turning a design or logo into a stitch file that can be read and understood by the computerized embroidery machine. A flat graphic or photograph is turned into an image made up of stitches. This image tells the needles how to move to create the embroidered version of the original image. Simply put, this is the number of stitches used to recreate the design. The higher the stitch count, the longer it takes for the machine to produce the product. Less dense designs, or those with longer stitches and more white space, will require fewer stitches. Our starting price includes up to 12,000 stitches, which is higher than the industry standard of 10,000. With less dense designs, it is normal to see the fabric beneath peek through the stitches. Highly dense stitches will be shorter, thicker and closer together. 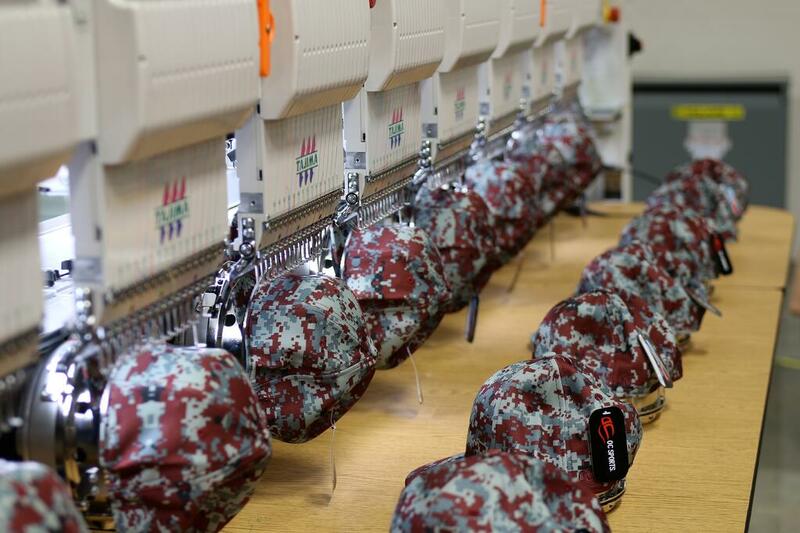 For your next custom headwear order, consider choosing domestic embroidery. It’s a quick and simple alternative to our Overseas Express and Custom Creative programs. Be sure to hit the subscribe button below so you don’t miss a single article in the upcoming embroidery series. While you’re there, let us know what you think about our plans for the series in the comments. Is there something particular you want us to cover? Let us know! You can also reach out to us on Facebook, LinkedIn, and Twitter.